Hello, lovelies:] Everyone have a good weekend? I slept in sooo long today, I was exhausted haha. Anyway, I have 2 coats of a new Zoya to show you: Carly! I really like this one, even if it doesn't exactly fit in with the rest of the collection. It dried really fast, same as most foils. I like the red base in it a lot, as well, I think it looks better with my skin than blue based purples. This is such an interesting foil! I've never seen one quite like this before, and I really like that it's a dark and rich color. 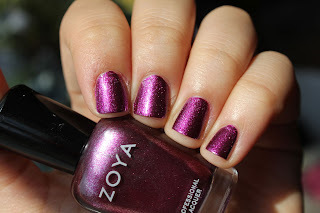 I also got the mini trio from Zoya so I can say that I LOVE Zuza and Kimber. Myrta's still a question mark in my mind, but we'll see how I feel after I wear it:] Based on them, I'm gonna have to go back for some more Zoyas!! Ohhh boy..
That is such a pretty color! I'm a sucker for purples! I'm not the biggest fan of foils but this is unbelievable! The purple and quality are clearly evident. This color is GORGEOUS on you! This is really lovely! I love the way it catches the light! Why do I not have this yet? SOOOOO pretty!!! !